I have commented before on the fact that, even in situations where people believe that evolutionary history is reticulate, phylogenies are still presented as a tree rather than as a network (see Why do we still use trees for the Neandertal genealogy? 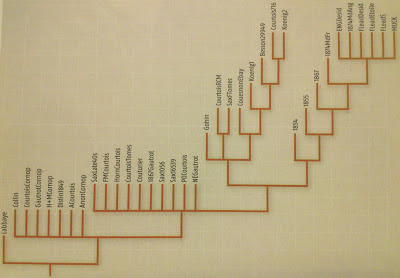 and Why do we still use trees for the dog genealogy? ); and I shall presumably comment on this again in the future. However, this blog post is about someone who stopped using a tree and started using a network: Niles Eldredge. More than 10 years ago (Eldredge 2000) he addressed the idea of the evolutionary history of the musical instrument known as a cornet (a soprano brasswind instrument similar to a trumpet), of which he had been a collector and historian for many decades (see Eldredge 2002). Originally, he presented a phylogenetic tree of selected cornets, covering the range of known phenotypic variation, based on several diagnosable morphological features (described by Eldredge 2000, 2002, 2011). A version of this tree was published in an interview that he did for New Scientist in 2003 (Walker 2003), and the ideas were subsequently presented in interviews for several other media, including the New York Times (Wertheim 2004) and the Fibreculture Journal (Barnet 2004). 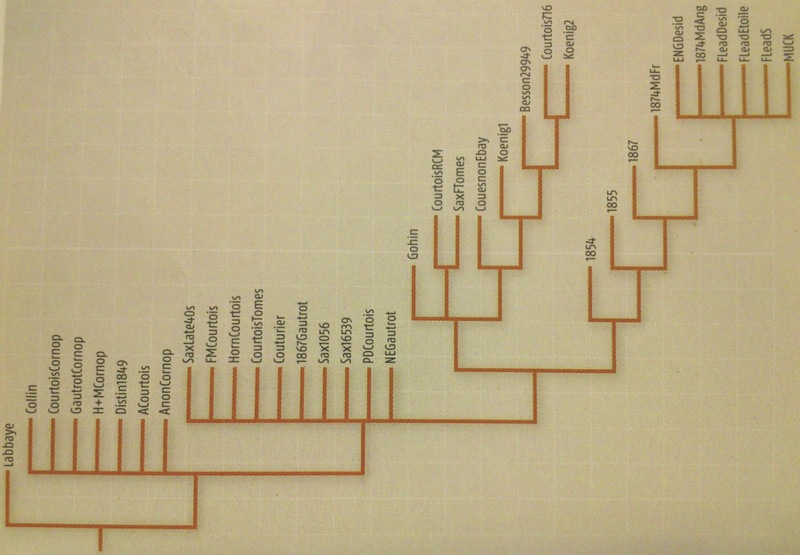 The original bush-like phylogenetic tree of 36 cornets (from New Scientist). It is based on 17 characters, although there are only 14 synapomorphies shown. His purpose was to show that cornets do not fit a traditional phylogeny well: they show a very punctuated history, with bursts of rapid radiation where features appear in many lineages. He attributed this topology to the distinct nature of evolution of cultural objects, where innovations developed in one lineage can immediately be transferred to other lineages, and even transferred to earlier parts of those lineages (see my previous post: Time inconsistency in evolutionary networks). That is, the bifurcating cladistic model of evolution does not apply — the tree looks more like a bush. Eldredge also noted that this "further implies, as a practical matter, that most of the algorithms developed to reconstruct biological history are inappropriate for the reconstruction of material cultural systems" (quoted in Barnet 2004). Indeed, the presence of lateral transfer of ideas means that a reticulating diagram would be a preferable mode of presentation for the history of cornets. So, his final version of that history became a network. The final network of 39 cornets (from Tëmkin & Eldredge 2007). Note that the branch lengths represent time, not character change. This network first appeared in 2007 in Current Anthropology, in a paper co-authored with Ilya Tëmkin (who apparently did the data analysis). Since then, it has appeared in various other places, including Eldredge (2009, p.302), Kelly (2010, p.51) and Eldredge (2011, p.372). "This phylogeny was generated by combining several analytical methods. First, three independent phylogenetic analyses were performed on the same data set. The neighbour-joining and maximum parsimony trees were computed in PAUP∗, and the reticulate network (based on the dissimilarity matrix generated in PAUP∗) was computed in T-Rex. The reticulate branches generated by T-Rex were subsequently plotted onto the neighbour-joining tree. The reticulate branches suggesting relationships that were not corroborated by the presence of at least a single character in any of the shortest trees in the maximum parsimony analysis were eliminated." The data are available, if anyone wants to have a go at devising a different approach. The paper by Tëmkin and Eldredge (2007) also contains an evolutionary analysis of the musical instrument known as a Baltic psaltery (a plucked stringed instrument similar to a zither). The phylogeny was presented as a tree in that paper, but the relationships have also been conceptualized as a network in a later analysis (see Veloz et al. 2012). Note There is a follow-up post here: Trees and networks of written manuscripts. Barnet B (2004) Material cultural evolution: an interview with Niles Eldredge. Fibreculture Journal Issue 3: FCJ-017. Eldredge N (2000) Biological and material cultural evolution: are there any true parallels? In: Tonneau F., Thompson NS (eds) Perspectives in Ethology: Evolution, Culture, and Behavior, pp. 113-153. Kluwer Academic, New York. Eldredge N (2002) An overview of piston-valved cornet history. Historic Brass Society Journal 14: 337-390. Eldredge N (2009) Material cultural macroevolution. In: Prentiss AM, Kuijt I, Chatters JC (eds) Macroevolution in Human Prehistory: Evolutionary Theory and Processual Archaeology, pp. 297-316. Springer, New York. Eldredge N (2011) Paleontology and cornets: thoughts on material cultural evolution. Evolution: Education and Outreach 4: 364-373. Kelly K (2010) What Technology Wants. Viking Press, New York. Tëmkin I, Eldredge N (2007) Phylogenetics and material cultural evolution. Current Anthropology 48: 146-153. Veloz T, Tëmkin I, Gabora L (2012) A conceptual network-based approach to inferring the cultural evolutionary history of the Baltic psaltery. In: Miyake N, Peebles D, Cooper RP (eds) Proceedings of CogSci 2012: 34th Annual Meeting of the Cognitive Science Society, pp. 2487-2492. Cognitive Science Society, Austin TX. Walker G (26 July 2003) The Collector. New Scientist 179: 38-41. Wertheim M (9 March 2004) Scientist at work — Niles Eldredge: Bursts of cornets and evolution bring harmony to night and day. New York Times.